This morning my husband and I were awakened from our sleep just after 5 AM by the plaintive meow of our 16 year old cat. She has not been doing well of late and so just hearing her voice and knowing she made it through another night helped to minimize the annoyance of having to get up earlier than planned. Don rolled out of bed, pulled on his Levis, and headed to the kitchen to give her a spoonful of canned food. He closed the bedroom door behind him so that our cattle dog (who has her bed in our room) would not bother the cat while she nibbled her meager meal. When Don opened the door to climb back into bed for a little more sleep, Sadie barked loudly at him, as if he were an intruder. As if she didn’t know it was him behind the door. Don was not happy and I can’t really blame him. We got Sadie from the Humane Society shelter when we moved here seven years ago. We had heard that Australian Cattle Dogs were high energy, but that wasn’t evident from the way she cowered in the corner of her pen. And the sign on her enclosure at the shelter labeled her as a quiet “wallflower”. She was two years old at the time and had been originally purchased from a breeder. The paperwork indicated that she had been relinquished by her owners because she was not “working out well” with an older dog in their home. That wouldn’t be a problem as were not able to bring our dog (an Australian Shepard that a friend wanted to adopt) with us when we moved to Maine. But what about cats? The shelter staff hadn’t had any experience in regard to that but they had been taking Sadie out to a local prison as part of an animal therapy program where she seemed to be doing well. We signed the adoption papers and agreed to provide Sadie with a “forever home”. For the first couple of weeks, Sadie did live up to her designation as a quiet wallflower. She was well behaved in the house and while she didn’t form any sort of bond with the cat, she nevertheless pretty much left her alone. As she adjusted to her new surroundings, she began to come out of her shell. She was, as most cattle dogs are, high energy. 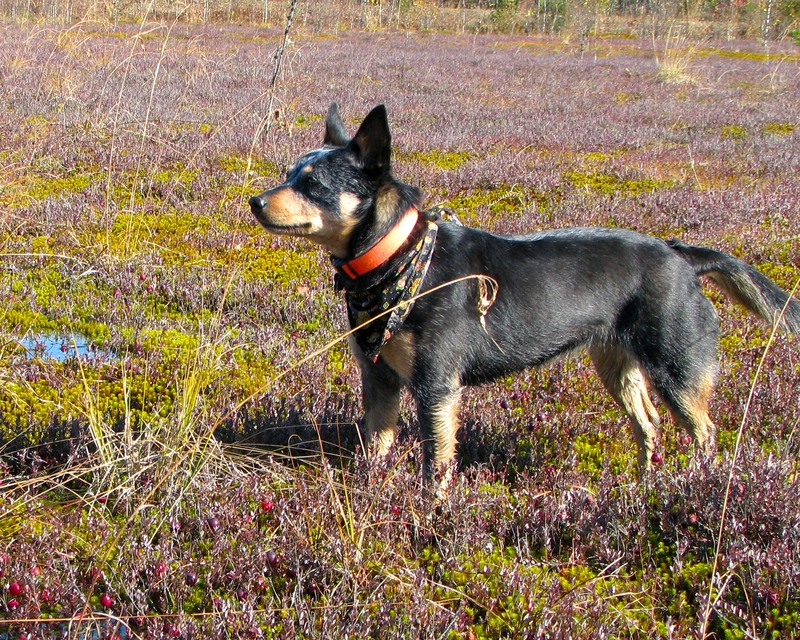 Not a problem as we are active as well and having Sadie around insures that we get out every day. We came to suspect that she may have been abused in the past as she trembles when we pick up any sort of implement, especially a broom. She is definitely “my” dog and she feels it is her role to protect me. But a couple of negative traits have been revealed that, try as I might, I haven’t been able to correct. One of those is a loud, obnoxious bark, often for no obvious reason. And another is her inability to get along with just about any other animal, including our elderly cat. We have always had dogs and every one was from a shelter or a stray. They each came to us with issues, but until now we were able to work through those. After seven years with us, Sadie continues to be a challenge. When you adopt a shelter dog you don’t always know what baggage they bring with them. I won’t quit trying to break the bad habits, but I fear her resolve will outlive her willingness to change. This entry was tagged adopting pets, animal shelters, Australian Cattle Dogs, Barking, high energy dogs, Humane Society. Bookmark the permalink.